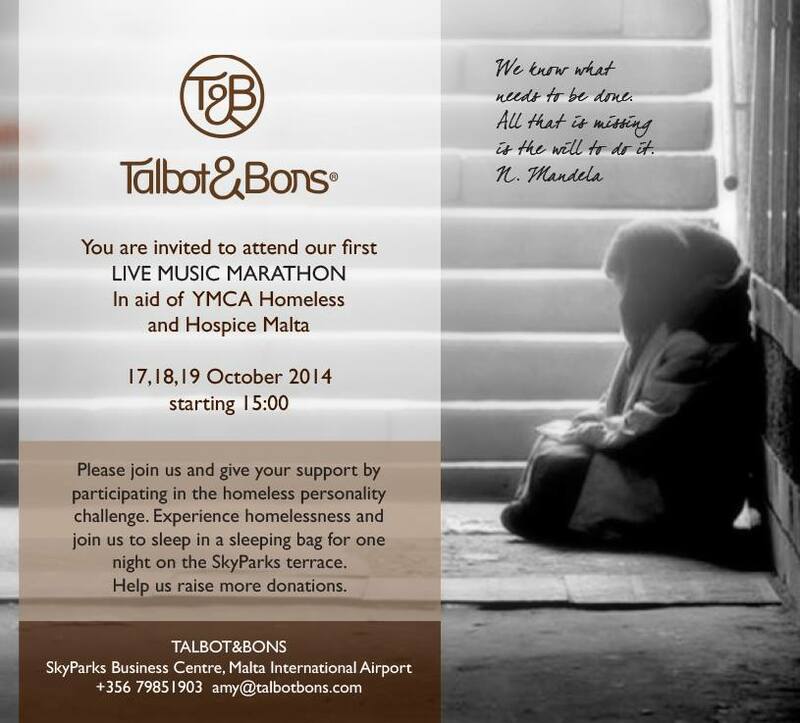 Talbot & Bons, the cafe-wine-lounge at Skyparks Business Centre, Luqa, is holding a three-day music marathon, sponsored by Methode Electronics in aid of YMCA Homeless and the Hospice Movement. Spread over 50 hours with non-stop music, the festival will feature some 45 acts musicians and bands covering a diversity of genres, as well as Malta’s most known personalities, who will also be present to raise awareness about both philantropic organisations that will benefit from the marathon. Kicking off at 3pm on Friday with Red Electrik opening the event, the marathon will see the participation of heavyweights Nadine Axisa, Claudia Faniello, Olivia Lewis, Pamela Bezzina, Glen Vella and Rachel Fabri, among others. The Vinny Vella quartet, the Jes Psaila and Friends, Carl Borg band and the Harry Eddleston trio, all known for their distinctive jazz contributions will also take part. Gianluca Bezzina will be closing the event on Sunday. Other names include dynamic musical trio Dumtak, who are expected to cover genres ranging from rock to pop and jazz, and folk/acoustic duo Kizum Klof. Musicians Alwyn Borg Myatt, Infinite Loop, The Residents, Fiona Cauchi, Ellipse Criminal Kiss, Sandrina & Keith (Kiko), Dbanned, Maria & Norbert, and Ben Purplle will also be taking part. 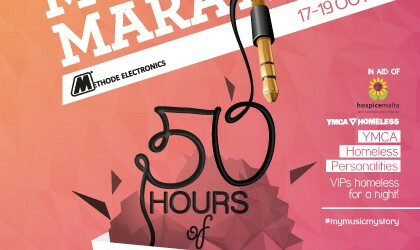 Other household names who will be lending a hand during the marathon include journalist Keith Demicoli, DJ Joe Tanti, television personalities Claire Agius Ordway, Owen Bonnici and Ronald Briffa; film-makers Mark Doneo and Salvu Mallia, footballer Justin Haber, actress Manolita Grech; actor Lino Mintoff; and MPs Silvio Schembri, Ian Borg and Toni Bezzina. 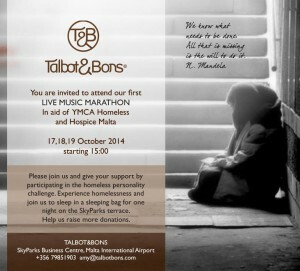 During the three-day marathon, Agius Ordway, Bonnici, Haber and Demicoli will be joining a number of personalities, including television hosts and other politicians, and spending the night camped on the Talbot & Bons terrace in order to raise awareness about the plight of homeless people. They will be joined by MPs Ian Borg and Kristy Debono, and television personality Xandru Grech; more names are being added every day. The marathon will offer different vibes during different times of the day. The evening will continue with some jazz numbers, while Saturday mornings will take on a child-friendly note with animation, attractions and music repertoire that will also appeal to the little ones. The event will also be attended by H.E. The President on Saturday. “At Talbot & Bons we take our corporate social responsibility very seriously and thus we decided to organise this event which we know our clients will enjoy and that will also help those with specific needs. Our target is to reach €10,000 over the weekend and we are convinced that the generosity of our patrons combined with that of the artists and other participants will help us succeed,” Talbot & Bons owners Amy Talbot and Alan Mercieca Bons said. 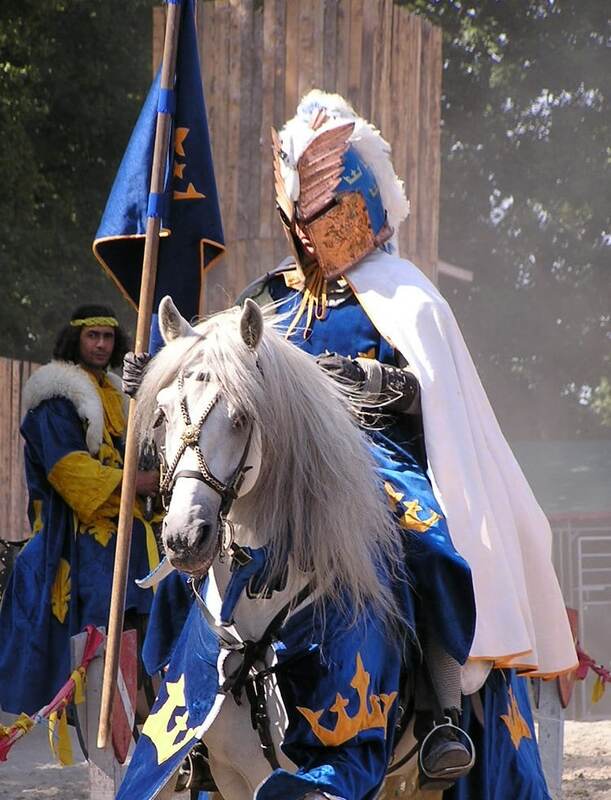 Funds will be raised through a variety of activities such as art auctions, merchandise, SMS donations, subsidised food items, raffles and more. The main sponsor of the marathon is Methode Electronics, with supporting sponsors The Vodafone Malta Foundation, Mochika, Enba, Microsoft, Toyota, General Soft Drinks (Coca-Cola), Entertainment.com.mt, Nexos lighting, Pure Concepts, Besteam, AF Sign Studio and Band Aid Music. The Talbot & Bons Music Marathon takes place between October 17 and 19. For more information visit the events page on Facebook.